In addition to enjoying the holidays, I spent a good chunk of December and January selling off extra motorcycle parts on eBay. Over the years, I've changed a lot on my bike and I was left with a pile of take-off parts cluttering up my garage. 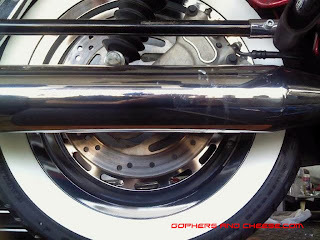 My old seat, handlebars, risers, tank, rear wheel, belt guard, and lots more have all been sold. Once they're gone, you almost never hear what happens to them, but the guy who bought my rear wheel shared his plan and then some photos. 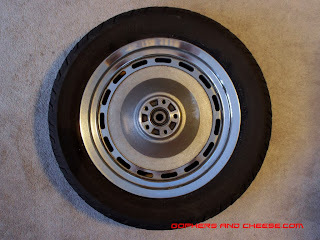 Here's the wheel and tire - just a typical 16" Sportster rear wheel. The chrome was in desperate need of a polish. The guy who bought it has a shop, American Cycle & Tire in Sylacauga, AL. He removed the tire, polished up the wheel, swapped the bearings, and I'm not quite sure what else. 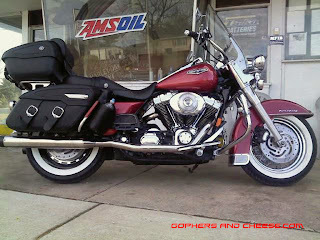 When he was done, it fit his customer's Road King perfectly and he sent me a couple of pics. I thought it was a pretty creative mod.